May 22, 2017 – Scientists using NASA’s Kepler Space Telescope identified a regular pattern in the orbits of the planets in the TRAPPIST-1 system that confirmed suspected details about the orbit of its outermost and least understood planet, TRAPPIST-1h. TRAPPIST-1 is only eight percent the mass of our sun, making it a cooler and less luminous star. It’s home to seven Earth-size planets, three of which orbit in their star’s habitable zone—the range of distances from a star where liquid water could pool on the surface of a rocky planet. The system is located about 40 light-years away in the constellation of Aquarius and is estimated to be between 3 and 8 billion years old. Scientists announced that the system has seven Earth-sized planets at a NASA press conference on February 22. NASA’s Spitzer Space Telescope, the TRAPPIST (Transiting Planets and Planetesimals Small Telescope) in Chile and other ground-based telescopes were used to detect and characterize the planets. But the collaboration only had an estimate for the period of TRAPPIST-1h. Astronomers from the University of Washington have used data from the Kepler spacecraft to confirm that TRAPPIST-1h orbits its star every 19 days. At six million miles from its cool dwarf star, TRAPPIST-1h is located beyond the outer edge of the habitable zone, and is likely too cold for life as we know it. The amount of energy (per unit) planet h receives from its star is comparable to what the dwarf planet Ceres, located in the asteroid belt between Mars and Jupiter, gets from our sun. 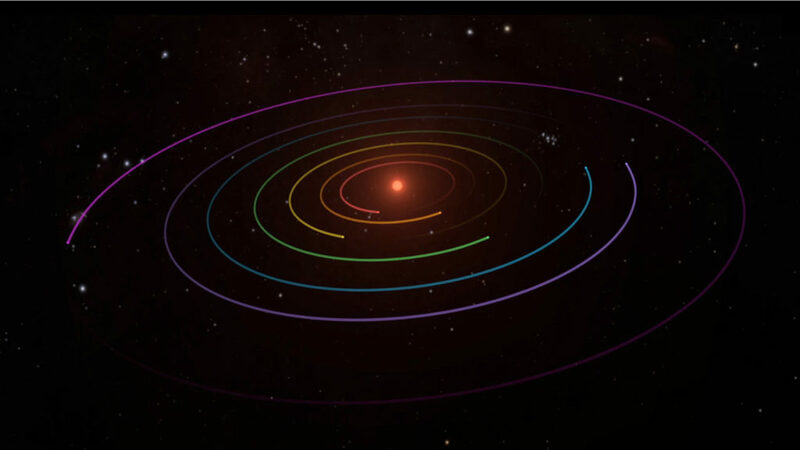 Using the prior Spitzer data, the team recognized a mathematical pattern in the frequency at which each of the six innermost planets orbits their star. This complex but predictable pattern, called an orbital resonance, occurs when planets exert a regular, periodic gravitational tug on each other as they orbit their star. To understand the concept of resonance, consider Jupiter’s moons Io, Europa and Ganymede, which is the farthest out of the three. For every time Ganymede orbits Jupiter, Europa orbits twice and Io makes four trips around the planet. This 1:2:4 resonance is considered stable and if one moon were nudged off course, it would self-correct and lock back into a stable orbit. It is this harmonious influence between the seven TRAPPIST-1 siblings that keeps the system stable. These relationships, said Luger, suggested that by studying the orbital velocities of its neighboring planets, they could predict the exact orbital velocity, and hence also orbital period, of planet h, even before the Kepler observations. The team calculated six possible resonant periods for planet h that would not disrupt the stability of the system, but only one was not ruled out by additional data. The other five possibilities could have been observed in the Spitzer and ground-based data collected by the TRAPPIST team. The Kepler spacecraft stared at the patch of sky home to the TRAPPIST-1 system from Dec. 15, 2016 to March 4 collecting data on the star’s minuscule changes in brightness due to transiting planets as part of its second mission, K2. On March 8, the raw, uncalibrated data was released to the scientific community to begin their follow-up studies. The work to confirm TRAPPIST-1h’s orbital period immediately began and scientists from around the world took to social media to share in real-time the new information gleaned about the star’s behavior and its brood of planets. Within two hours of the data release, the team confirmed their prediction of a 19-day orbital period. TRAPPIST-1’s seven-planet chain of resonances established a record among known planetary systems, the previous holders being the systems Kepler-80 and Kepler-223, each with four resonant planets. The TRAPPIST-1 system was first discovered in 2016 by the TRAPPIST collaboration, and was thought to have just three planets at that time. Additional planets were found with Spitzer and ground-based telescopes. NASA’s Hubble Space Telescope is following up with atmospheric observations, and the James Webb Space Telescope will be able to probe potential atmospheres in further detail.